When you think of visiting animals in their natural habitat on an adventurous holiday, Africa may be the first place that comes to mind. While an African safari is definitely an adventure, may we suggest something a bit closer to home? Rather than heading toward the equator, set your compass north—to Alaska, to be exact. A trip to Alaska offers an amazing opportunity to see a remote yet exciting part of the United States that many people don’t visit. If you love animals then seeing polar bears, seals and penguins in their natural habitat is an opportunity like no other. Barrow, the northernmost U.S. city, offers travelers the best viewing opportunities. Plan your trip during the spring or fall, when whaling season is in high gear. It’s during these times that polar bears are attracted to the shore in search of whale carcasses. Fly into Anchorage or Fairbanks, where you can catch a flight to Barrow. Or from Fairbanks, you can travel instead to the Arctic National Wildlife Refuge. In either area, you are virtually guaranteed a chance to see these amazing bears surrounded by their natural habitat. Should you choose to stay in Barrow, many of the local taxi drivers are well aware of the best viewing areas and will be happy to take you. In Kaktovik, home of the Arctic National Wildlife Refuge, you can easily find a local to take you on a tour! Do be aware, though, that polar bears have absolutely no fear of humans—keep your wits about you at all times! Why Are Polar Bears an Endangered Species? According to the World Conservation Union, or IUCN, there are only an estimated 20,000 to 25,000 polar bears remaining in the world. Polar bears call only five countries home: Canada, Russia, Greenland, Norway and the United States. These highly solitary animals are in grave danger of becoming extinct and may be so by the year 2050. Due to the increasing temperatures of our planet, polar bears are experiencing a loss of habitat. The survival of the species is solely centered on the availability of sea ice. Polar bears thrive on seal meat. 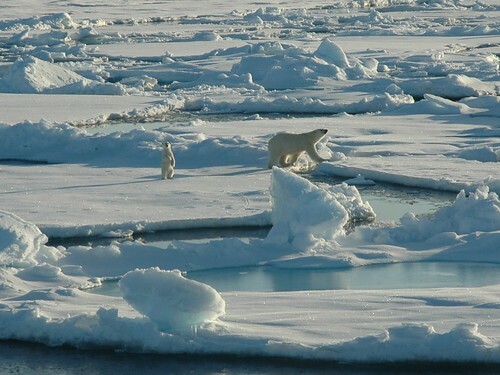 As seals under the ice surface to breathe through holes, polar bears catch and kill them. As the ice shrinks, seals are forced to move to more protective habitats, which in turn depletes the bears’ food source. When it is time to give birth to her young, a female polar bear digs a den in the soft, deep snow of the arctic. Since the deep snows are melting, female bears have no way to protect their cubs from the harsh climate. The mortality rate among polar bear cubs is now rising due to the lack of adequate snow. As food sources in the wild become scarce, bears are forced to look elsewhere for sustenance. 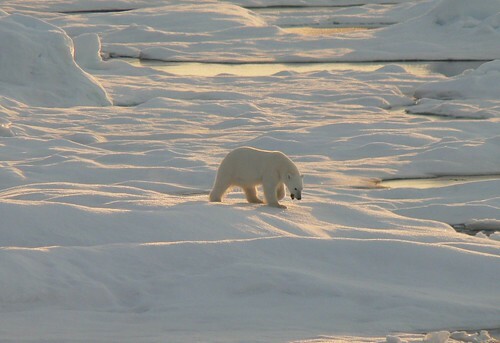 This can lead polar bears into human settlements as they search for garbage and animal carcasses. Humans are forced to defend their lives and property from these bears, often resorting to killing the magnificent animals. Poachers in the wild are a distinct threat to the polar bear. Prized for both their fur and their blubber, polar bears have found themselves in tremendous peril at the hands of these criminals. By reducing our carbon footprints, we can help to alleviate the rapidly rising temperatures of our planet due to global warming. Unfortunately, even if all emissions were to cease today, our planet’s temperature would still continue to rise for several decades. There are actions we can take, however, that will be of immediate assistance to these wonderful marine bears. Protecting the bear’s prey, eliminating trophy hunting and addressing illegal poaching will go a long way in protecting these lovely bears. By suspending oil and gas developments until measures are taken to protect polar bear habitats, we may be able to remove the very real threat of extinction. A visit to Alaska will give you the chance to not only see beautiful scenery but an opportunity to view polar bears as they should be seen; not in a zoo but in their own natural surroundings. It’s a perfect way to spend your vacation. Connie Prescott the author of the “North to Alaska – Polar Bear Country” is a conservation writer who works with NRDC and other organizations to protect our health and environment. The issue of environmental policy is important to ensure the preservation of our planet’s beautiful vistas and endangered wildlife, a chance that may not be afforded to future generations.